The current leaders of the National League East and West will face off this for a 4 game series in San Francisco starting this Thursday July 28th. With only a 1 game differential between the two teams this is sure to be an interesting series. The Washington Nationals are currently 59-42 with a PCT of 0.584 and a road record of 28-22. They have only won 4 of their last 10 baseball betting games, but they are looking to rebound from that less than perfect record. The one good thing they have is that their offence has been very consistent and are averaging 4.67 runs per game which is above the average for the league which currently stands at 4.46. For Game 1, the Nationals will be starting 29-year-old right hander Tanner Roark, this will be his 21st start this season, and he will try to bounce back from a loss on his last outing against the Padres which shouldn’t be hard for him since he had 5 straight wins before that one loss. This season he is 9-6, with an ERA of 3.05 and a WHIP of 1.17, so he is having a pretty good season, combined with an outstanding offense the Nationals seem to be in pretty good shape. The San Francisco Giants record stands at 59-41 with a PCT of 0.590, their at home record is 30-18. Although they won their last game they are only 2-8 in the last 10 games, so they have to find a way to get their mojo back if they want to hold on to the lead in the National League West. This should be perfectly doable for them because they have a strong offence that is well above the average for the league. They are currently averaging 4.61 runs per game while allowing only 4.05. Johnny Cueto will take the mound for the San Francisco Giants on Thursday, the 30-year-old right hander is having one hell of a season, he is 13-2 with an ERA of 2.53 and a WHIP of 1.03. Although he was a determining factor in the final score against the Yankees on July 23rd, a game that went into extra innings, he was credited with the win after striking out 9 and giving up only 1 run which was unearned on 6 hits and a walk in a total of 6 innings. He is expected to put on another strong outing for game 1 against the Nationals. My Prediction for this game? 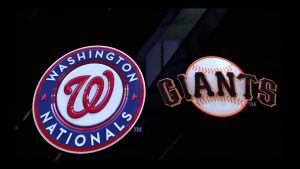 Even though on paper the Nationals seem to be the stronger team in this series, I have to give game 1 to the Giants, for the home field advantage and the incredible season Johnny Cueto is having. Place your bets on this game or choose another MLB game or sport at Ace Sportsbook.